Mandated to be both gatekeeper and traffic cop for the drug trade, the Food and Drug Administration instead tolerates false and misleading promotion of psychotropic drugs  substances which poison the body and which can kill with little or no warning. What is not addressed is why drugs are taken and abused. And the amount of money and effort spent on successful education, prevention and real rehabilitation is so small as to be non-existent in comparison to that spent on faulty solutions. This trend must change, and change dramatically. 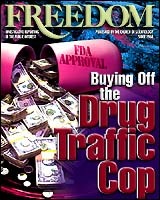 Thus, in this issue, we explore neglected aspects of the drug problem which confronts America. We also offer solutions and reforms at all levels. 1998 marks Freedoms 30th anniversary year. We are proud of our legacy of bringing readers the truth on issues such as crime, drugs, illiteracy and other matters of social and political concern, exposés of those who infringe human rights or individual freedoms, and special features on the broad range of topics that, over three decades, Freedom readers have come to expect.